During the 1960s, the foreign-born percentage of the U.S. population hit its lowest levels, hovering around just five percent, according to the U.S. Census Bureau. Still, the decade would lay the seeds of a lasting change in the nature of U.S. immigration. The Civil Rights movement and a burgeoning counterculture helped to pull society away from racial and ethnic discrimination and from the policies that had typified the post-World War II establishment. Since the 1920s, U.S. immigration policy had focused on a quota system that strongly favored northern European residents. In the early 1960s, residents of Ireland, Germany, and the United Kingdom received almost 70 percent of available quota visas. The Immigration and Naturalization Act of 1965 changed all that. 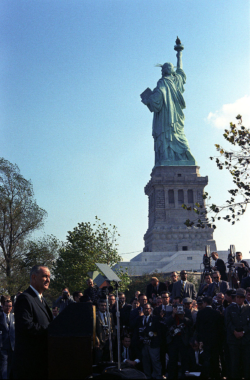 Sponsored by Representative Emanuel Celler of New York and Senator Philip Hart of Michigan and signed by President Lyndon B. Johnson at a ceremony on Liberty Island, the Act abolished the quota system in favor of a regime that established immigration preferences by categories. The 1965 law reserved 6% of visas for refugees, 10% for professionals, scientists, and artists, 10% for needed workers, and 74% for family members of naturalized U.S. citizens. This policy favoring family reunification would result in significant demographic changes over the coming decades, as immigration from Europe declined and the U.S. welcomed an increasing flow of migrants from Asia and Latin America.